Although it doesn’t officially open until tomorrow (April 1st) owners and gardeners Michel and Sylvie let us have a sneak preview of their garden near St Biez-en-Bélin yesterday – it’s always a treat at any time, but doubly so when you have the place to yourselves! We found that there have been changes – as every year – over the winter. Some borders have been entirely dug up, resculpted and replanted, hedges chopped and altered to give new views, and more hard paving added here and there. Two gorgeous camellias imported from Japan and sculpted into “cloud” forms have been planted either side of one of the paths, but Michel fears they may not survive as they went in just before the record cold spell of February. We have fingers crossed that they’ll pull through. The new ticket office/reception area that Michel had hoped to get permission for and build over the winter has not come to fruition – a victim of planning red tape. He hopes it’ll get through at the fourth attempt! Michel is a passionate gardener and he has a small nursery sales area with many of the plants you find in the Petit Bordeaux garden – as usual we came home with a load of new plants and (yet another!) bird sculpture for our garden at La Basse Cour. 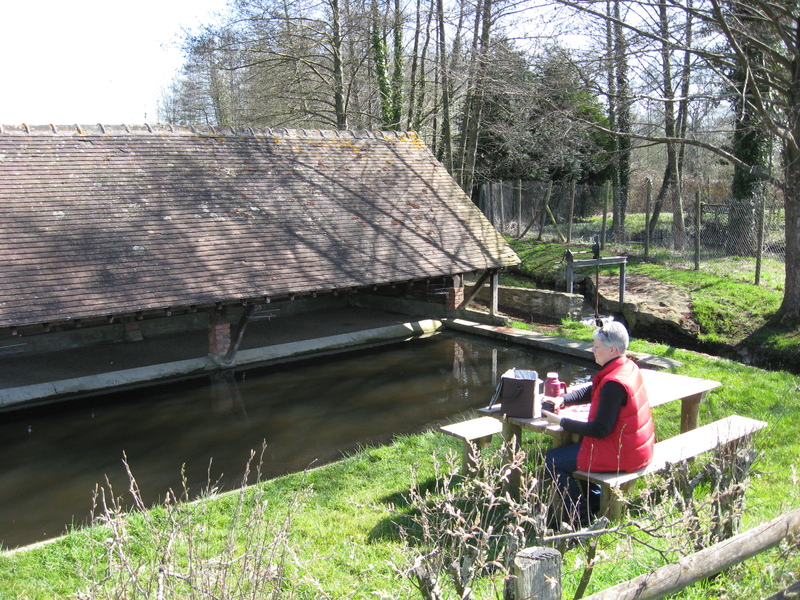 After our visit we went to our usual spot for a picnic, down by the stream at the old lavoir of St-Biez-en-Bélin – take the little road opposite the bar in the village centre, signposted “aire de repos”. It’s about a kilometre down the road. The Petit Bordeaux garden is open 1 April to 15 November, every day except Tuesday, 10.00h to 12.30h and 14.00h to 19.00h.